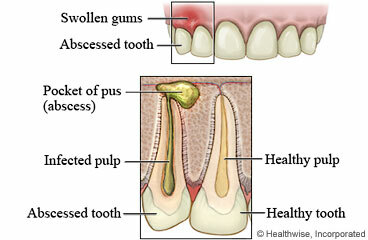 An abscessed tooth is a tooth that has a pocket of pus in the tissues around it. Pus forms when the body tries to fight an infection caused by bacteria. If the pus cannot drain, it forms an abscess. An abscessed tooth can cause red, swollen gums and throbbing pain, especially when your child chews. Your child may have a bad taste in his or her mouth and a fever, and your child's jaw may swell. Damage to the tooth, untreated tooth decay, or gum disease can cause an abscessed tooth. An abscessed tooth needs to be treated by a dental professional right away. If it is not treated, the infection could spread to other parts of your child's body. A dentist will give your child antibiotics to stop the infection. He or she may make a hole in the tooth or cut open (lance) the abscess inside your child's mouth so that the infection can drain, which should relieve your child's pain. Your child may need to have a root canal treatment, which tries to save the tooth by taking out the infected pulp and replacing it with a healing medicine and/or a filling. If these treatments do not work, the dentist may have to remove the tooth. Reduce pain and swelling in your child's face and jaw by putting ice or a cold pack on the outside of your child's cheek for 10 to 20 minutes at a time. Put a thin cloth between the ice and your child's skin. Give pain medicines exactly as directed. If your child is not taking a prescription pain medicine, ask your doctor if your child can take an over-the-counter medicine. Give your child antibiotics as directed. Do not stop using them just because your child feels better. Your child needs to take the full course of antibiotics. Have your child brush and floss every day and get regular dental checkups. Give your child a healthy diet, and avoid sugary foods and drinks. Enter R932 in the search box to learn more about "Abscessed Tooth in Children: Care Instructions".